Before I even start with this review, I want to acknowledge the elephant in the room. You know what I’m talking about, right? Those two little words that are popping up more and more frequently these days, particularly in the world of ‘big two’ comics. Okay, so stacking events on top of events (on top of events) is always going to rub certain people the wrong way. And for those people who are well and truly fed up with these kind of things, No Justice is likely to be a bit of a hard sell. But bear with me folks, because if this first issue is anything to go by, this is actually shaping up to be a heck of a lot of fun. It’s a fantastic idea at its core, acknowledging that the established “super teams” are too predictable and poorly constructed, leaving them vulnerable to exploitation, and watching Braniac decimate pretty much the entirety of the world’s superhero roster with a simple mathematical formula makes for a thrilling opening to this issue. However, it’s how Braniac reacts next that provides the real meat of the event. See, he isn’t the main threat here. In fact, he’s just as helpless against the destruction that’s coming as everyone else. But he has a plan. A plan that involves reshuffling the superhero (and villain) deck, restructuring teams to better emphasise and complement each other’s strengths, and hopefully providing enough synergy to combat the impending celestial menace. Having three separate writers on a single issue is always going to raise a massive red flag, but the collaboration between Snyder, Tynion IV and Williamson feels natural and fluid here. There’s a massive cast of characters, and as such, nobody really steps up as the main focus – aside from Braniac himself and the somewhat counter-productive Amanda Waller – but this approach actually works well to accentuate the epic scope of the event, laying out the key players before splitting things down into smaller groups. 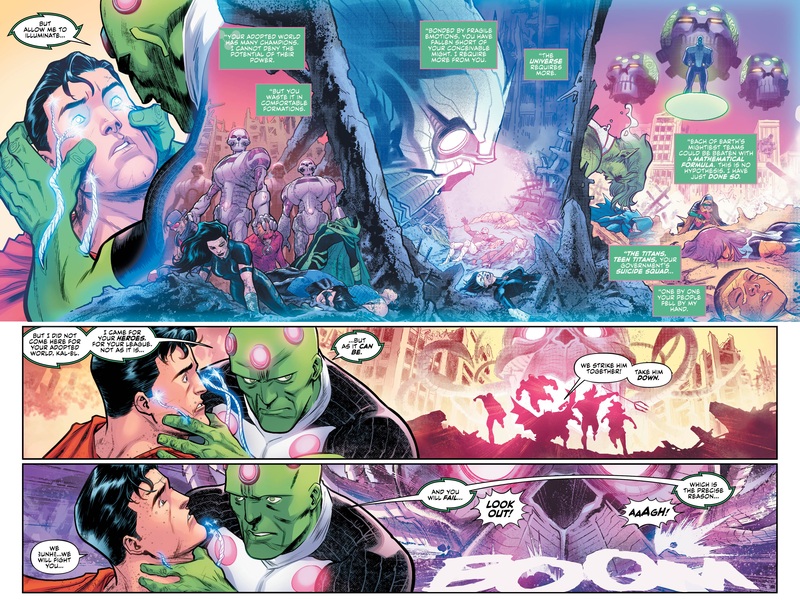 Similarly, Francis Manapul does a strong job on the visual side of the book, playing in the ultimate sandbox as he gets to illustrate pretty much every character of note in the DC Universe. He manages his pages and panels effectively, cramming in the massive amount of exposition and character reactions required without things ever feeling too overcrowded. Double-page spreads help to add a sense of scale and cinematic drama to the proceedings, and the characters all look and feel authentic throughout. It’s also worth tipping the hat to the work of Hi-Fi, whose colours infuses this issue with a real sense of energy, particularly during the moment where we get our first look at one of the ‘big bads’. The final pages feature a facepalm of epic proportions (but in a good way, like when an idiot in a slasher movie runs into the basement rather than out of the house, making the film more enjoyable in the process), raising the stakes immeasurably and throwing things wide open as our grudging defenders are forced to scramble to deal with the impending threat. It’s bold, cinematic storytelling of the highest order, and fully encapsulates the “go big or go home” ethos of this entire event. Overall then, as a set-up for a cracking premise, No Justice #1 does its job admirably. Sure, it’s going to be interesting to see whether the series manages to maintain its momentum once the initial novelty wears off, but if the interplay between the different forced ‘teams’ of heroes and villains so far is anything to go by, there’s going to be more than enough intrigue and entertainment to keep this event afloat. 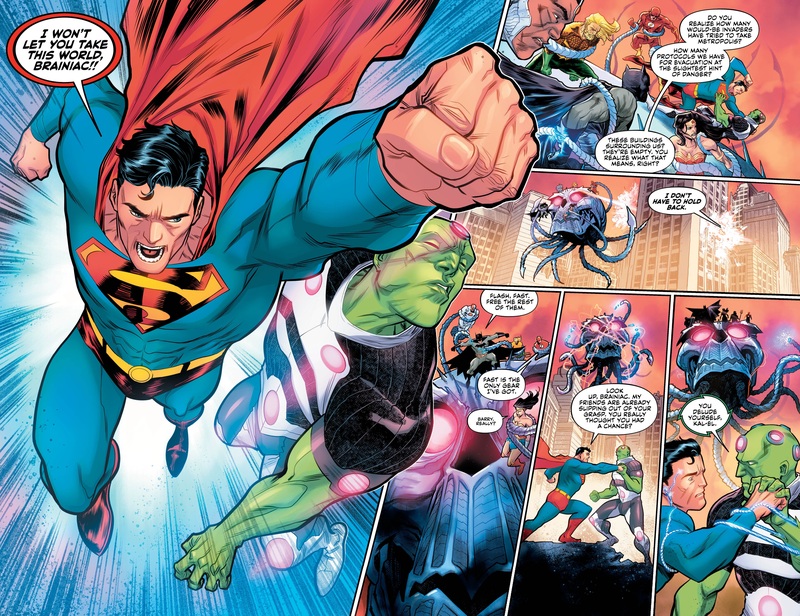 No Justice takes the traditional DC “summer event”, breaks it down into its component parts and puts it back together in a far more pleasing formation. Highly, highly recommended.